Export Exchange Online Mailbox, Contacts, Calendars, & Tasks to PST, EML, and MSG. Microsoft Exchange Online or Office 365 exporter is an easy-to-use application, which also provides facility to split large Outlook Data file by size. Awesome tool to export mailbox from Office 365 to PST file format. Those who need to migrate data from Office 365 to Outlook can use this software. "Office 365 Export tool is really very helpful to take backup of o365 Exchange online mailbox to PST without taking long time span. I, personally use this tool and also recommend everyone to opt for o365 Export Tool." "Solução perfeita para exportar caixa de correio de arquivo morto para PST do webmail do Office 365. " "The technicalities and the preciseness in the working of Office 365 Maibox Export Tool really attracted me. The ease in my tasks that I got using this tool is what I was looking for since long." "I love this Office 365 Export product, it works very well. I could export mailbox from Office 365 to PST format easily just in few clicks. We are looking forward to its next update. I would like to give rating 4 out of 5." 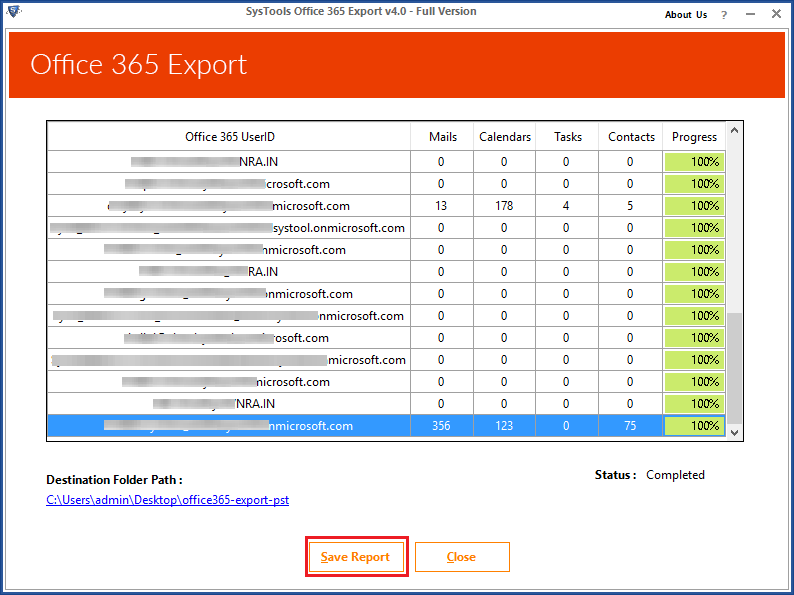 The Office 365 Exporter tool enables users to backup account mailboxes of MS Office 365 domain to another email client. All the Exchange online email folders gets saved in the chosen file format. Apart from this, the software also supports migration of contacts, calendar, and tasks from Office 365 to Outlook. 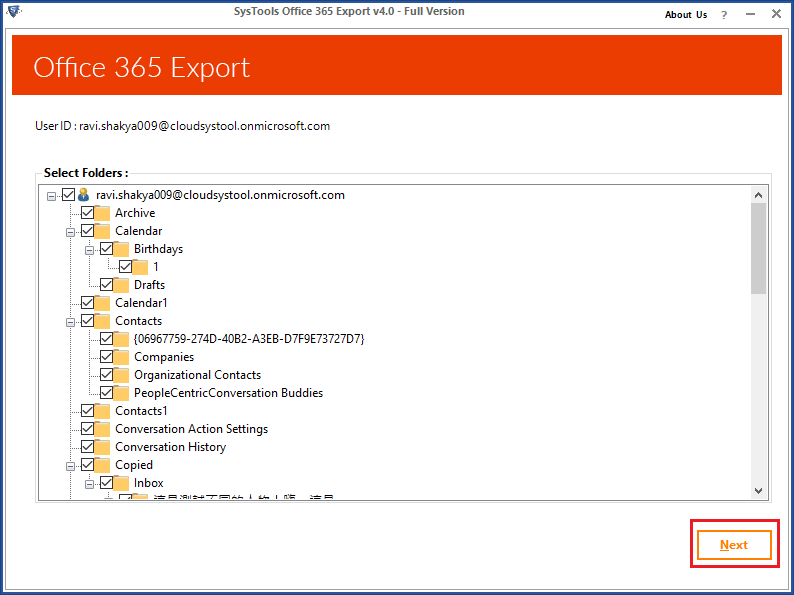 EML: Export messages from Office 365 to Thunderbird, Apple Mail, PocoMail, etc. While exporting Office 365 mailboxes to EML / MSG, the Office 365 export tool provides a useful option of saving files with desired naming pattern. Users are free to select any of the naming style option from the list provided to them via this product. The chosen pattern will be implemented in all resultant messages files of the software. The Microsoft Exchange Online or Office 365 exporter provides a very useful option for Administrative set of end users. While moving mailboxes with this tool, users will be able to exhibit migration with / without impersonation feature. This allows migration from single as well as multiple user accounts all at one time. This application allow user to export contacts from Office 365 account into desirable formats. The tool successfully export Office 356 contacts including telephone number, email address, mobile number, work address and the location. 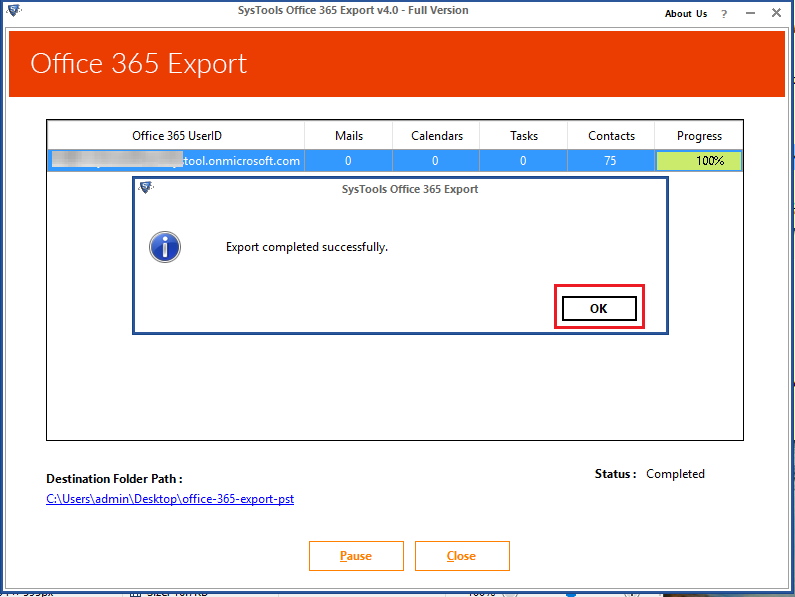 Using Office 365 Exporter, user can export calendar from Office 365. All Office 365 calendar appointments, and recurring appointments within specified date ranges will also be migrated along with Start Date, End Date, Time Zone, Repeat, Category. Calendar attachments such as files and documents, Cloud attachments (As file & OneDrive Link) will be migrate with their associated event/appointment. User can easily export tasks from Office 365 account into required format. The tool will migrate Office 365 tasks with Due Date, Start Date, End Date, Priority, Reminder, % Complete. If any files and documents attached to a task will also be exported. The processing of the application can be paused in between, if something goes wrong. This feature is useful in case when the internet bandwidth is needed for some other tasks or net connection is slow at the processing time. One will be able to resume conversion procedure from the exact point where it had left. What Free version of Office 365 Export Tool does? 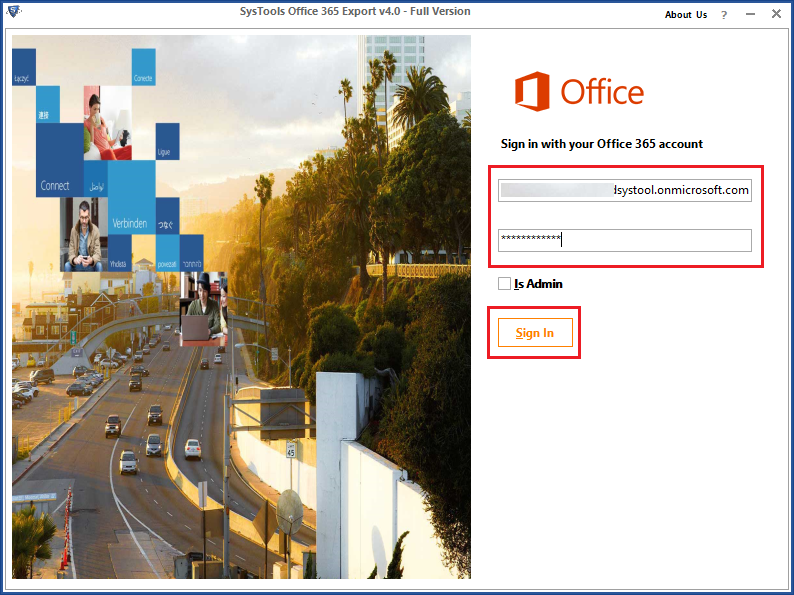 First Download » Install » Launch Office 365 Export Tool and click on Login Button. Enter Email id of admin, Password and hit on "Sign-in" button. Note: Make sure to check "Is admin" option. Under Email format, select Microsoft Outlook PST. To split large PST, you can select "Split" option. Under Categories, you can select any option to export data from Office 365 to PST format. Here, I seleted "Mails" only. Click on "Date Filter" to export selected emails from Office 365 to PST or any other formats. Check "Archive Mailbox" option to export Office 365 Archive mailbox to PST format. "In-place archive mailbox" option must be enabled in User's Office 365 email account. After selecting the location, click on "Start" button. Now, Office 365 Export process will start. Office 365 Export process completed succefully. Hit on the "Save Report". Report will be saved succefully. Click on "Login" Button after downloading Office 365 Export Tool. Enter Credentials and do not check "Is Admin" option. 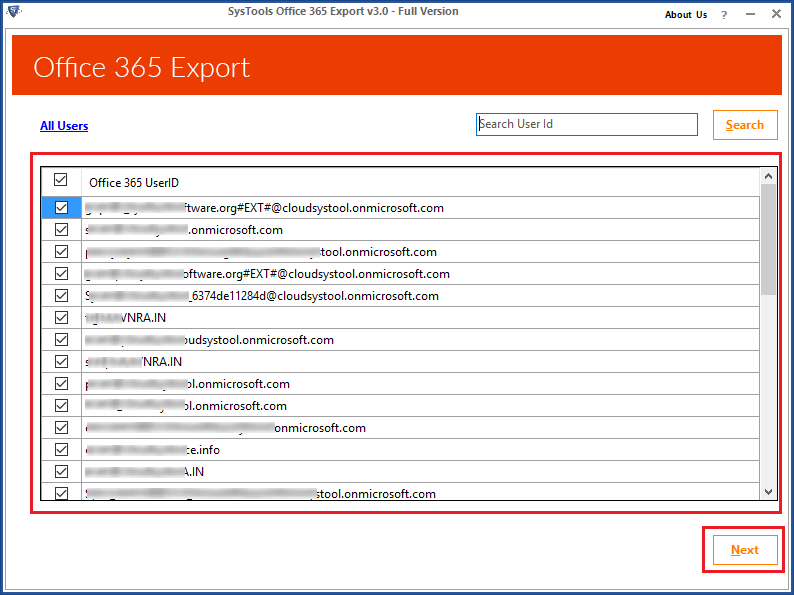 Office 365 Exporter will show you the folder hierarchy of each id that has been added in the tool. Select "Mail" from Category list. 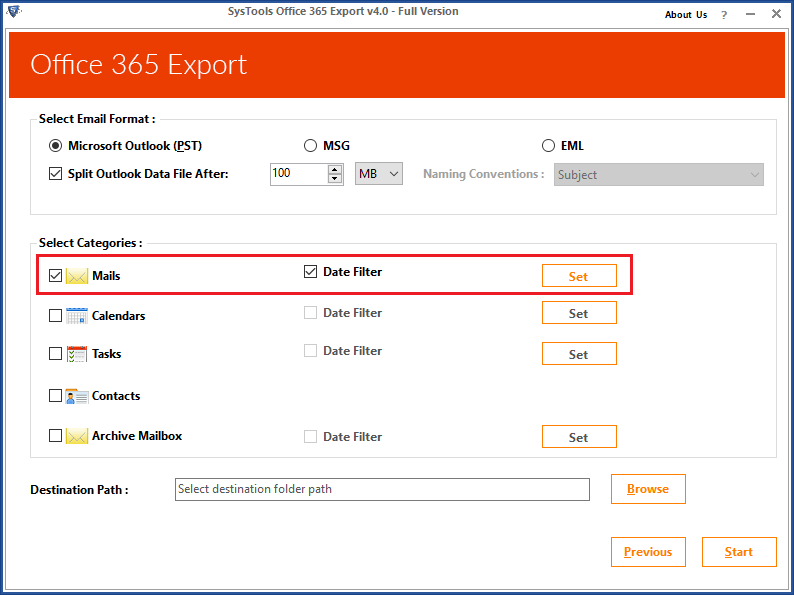 Hit on "Date-Filter" option to move selective data from O365 to PST file. Mark a tick on "Archive Mailbox" option to Archive Office 365 mailbox to PST format. "Office 365 In-place archive" option should be enabled of Office 365 user's email account. Click "Start" after selecting the destination. Office 365 Export Process will begin now. First Screen of Office 365 Export Tool. Enter here Credentials of Office 365 Account. All O365 email account will appear in this screen. Select File format to Export Office 365 Mailbox. 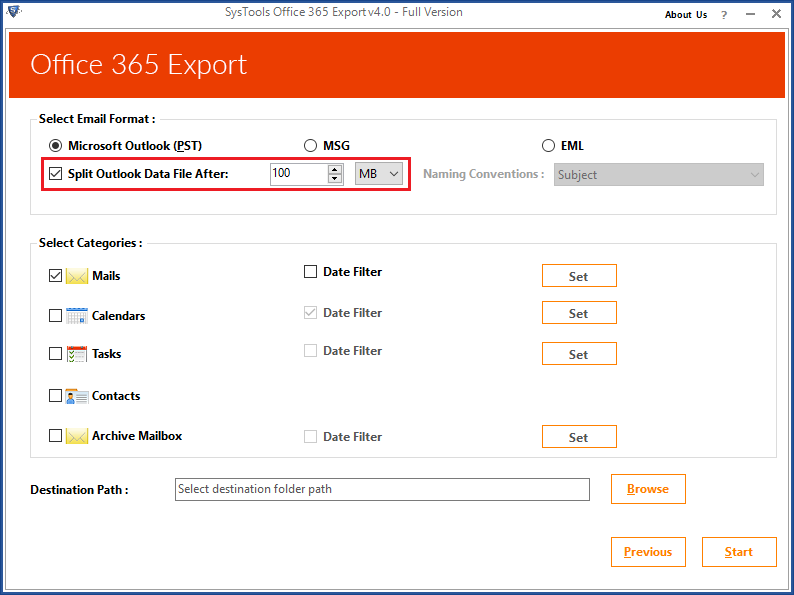 Different Categories available to export O365 Data. 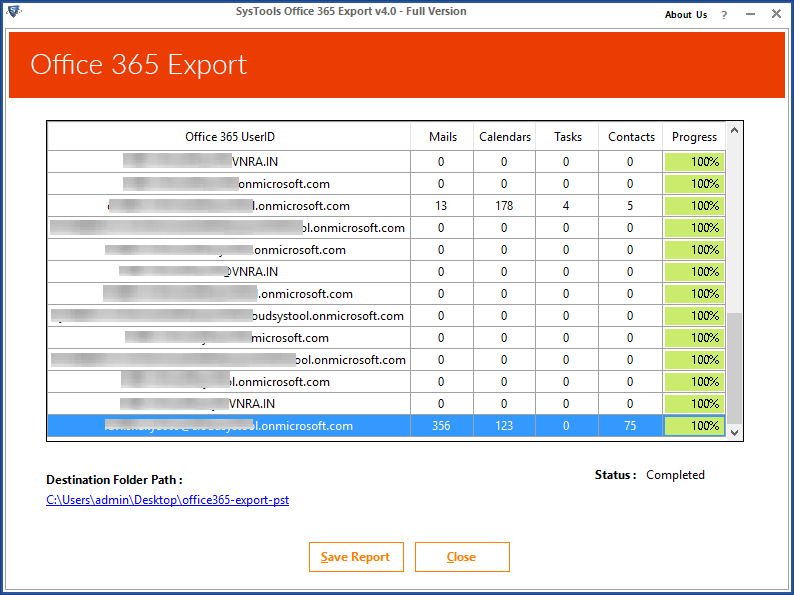 Complete Report Generated by O365 Export. The developers of Office 365 Exporter have made the migration profitable and trouble-free for me. After personally experiencing this product, I can say that no other tool can even come close to this. The way its interface is designed by simplifying technology is of great appreciation. 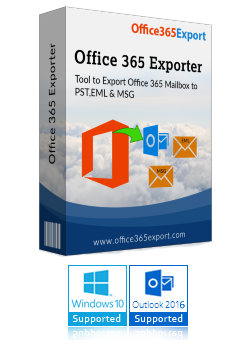 I am going to suggest this product to all those searchers who are finding how to export Office 365 mailbox to PST format. We have used this Office 365 Export tool to migrate nearly about 70 user accounts of an Office 365 domain to Outlook PST file format. 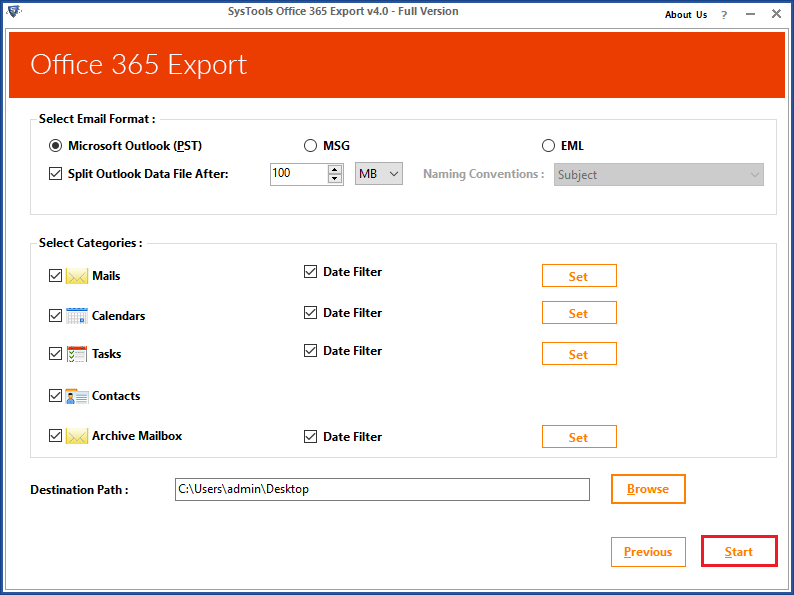 There is a lot to say about this Office 365 Mailbox export tool but, the best things to state is its performance and technicalities. Each and every module of the product was easily understandable with not even a single confusion while attempting the task. Thanks a lot guys for coming up with such an eminent product in the market! Attempting the task of exporting Office 365 mailboxes to PST files with manual techniques was really a complicated task. I was puzzled with all the manual operations and immediately ringed my friend to help me by providing a simple measure. He suggested me to use this Office 365 Export PST tool and I took his words. Oh my god! What to say? Only thing I can say is that it is now a game for me to export Office 365 user mailbox to PST. 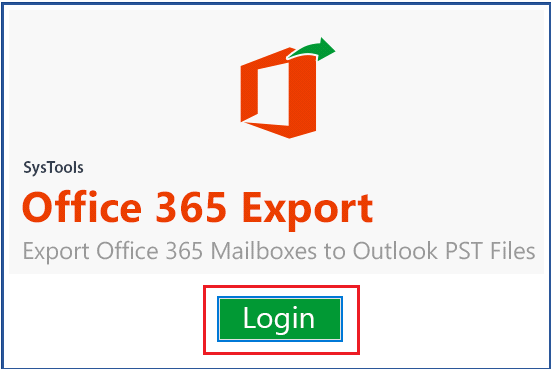 Is Office 365 Exporter providing any feature through which I can export Office 365 mailbox to PST file from multiple user accounts? Question: I am the IT administrator in a IT firm where I holds 150+ user accounts in an Office 365 domain for official purpose. Recently, the director of my firm had decided to shift from Office 365 to Outlook Mail for security purpose. So, I want to know- Is there any functionality in your tool through which I can process and export Office 365 mailbox to PST for multiple user accounts data all at once? 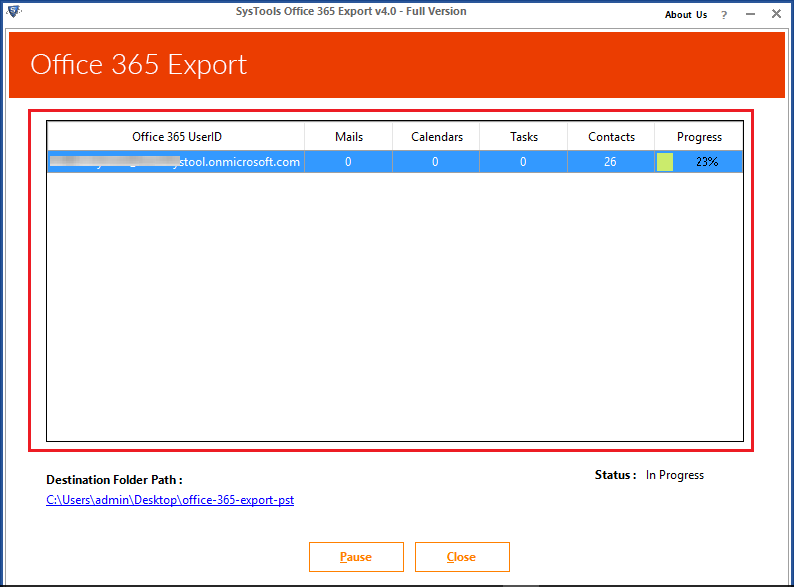 Solution: Yes, you have to use impersonation feature of Office 365 mailbox export PST tool. You just need to check the checkbox of ‘Is Admin’ on the screen where you are entering the Office 365 admin credentials. What are the prerequisites required by your Office 365 PST Export tool ? 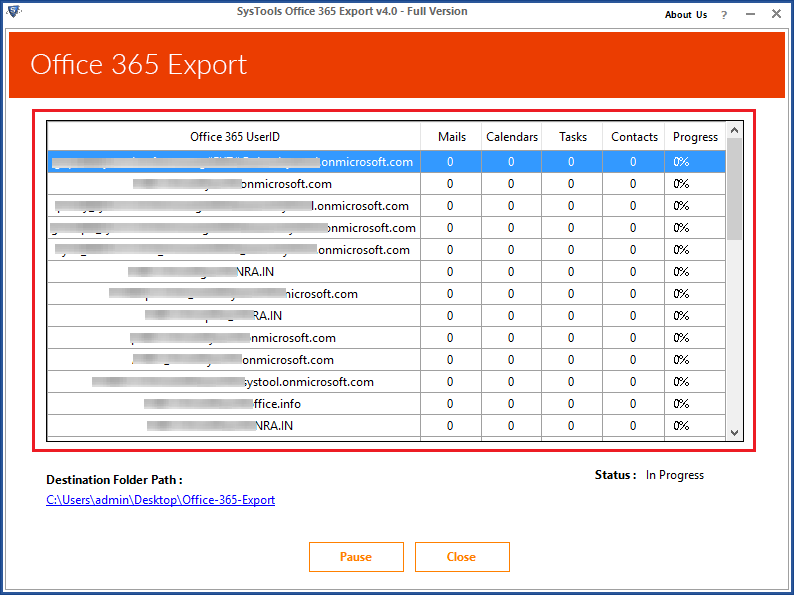 Question: I find your export Office 365 mailbox to PST tool reliable for export contacts from Office 365 to CSV. However, I am having a doubt that will this Office 365 exporter work without MS Outlook installation as supportive program or not? Can any technician help me out in clearing this doubt? A complete setup of Microsoft Online Services assistant is needed to export Office 365 emails to PST/ EML / MSG. Will the resultant EML files work in Mozilla Thunderbird email program? Question: I want few emails of certain time period to be saved in EML format. For this purpose, I purchased your Office 365 export PST tool because it is having date filtering feature within it. But, after buying, a question struck in my mind that will the output EML files work in Thunderbird 52.5.0 (32-bit) or not? Solution: Yes, the EML files generated by the Office 365 exporter will work in all its supportive program. This can be any like Mozilla Thunderbird, Apple Mail, PocoMail, Windows Live Mail, etc. What type of PST file will be created by Office 365 Mailbox Export tool at the end of entire procedure? Question: I have gone through your entire product page description of MS Office 365 to Outlook migration software. Actually, the tool fits for all the requirements that I want. However, I have a query in my mind that the PST file created by your Office 365 PST export tool will get accessed in MS Outlook 2013 or not? 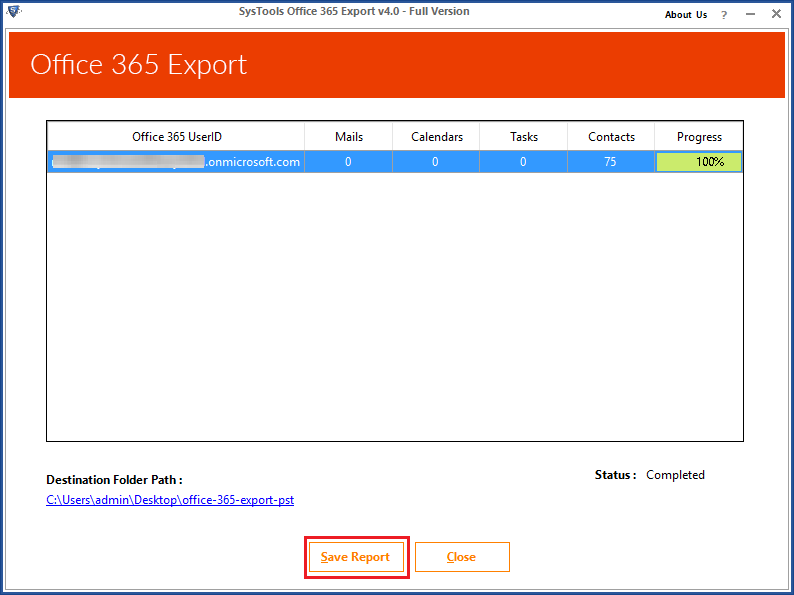 Solution: The Office 365 mailbox export tool creates PST file of UNICODE type, which is workable on MS Outlook 2016, 2013, 2010, and all below versions.